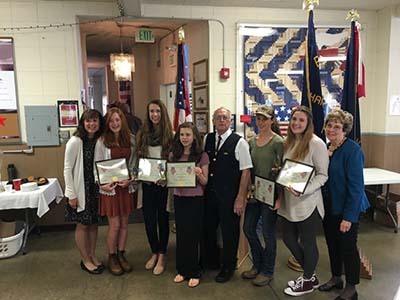 The El Dorado County Office of Education (EDCOE) Charter students recently received Regional, National, and Local awards for their exceptional writing at a dinner hosted by the Fleet Reserve Association. Each year, the Reserve sponsors a writing contest for 7-12th grade students to promote the spirit of American patriotism among our country’s youth. Embracing this year's writing theme, What Memorial Day Means to Me, the Charter students showcased their skills and came away with several awards. Macey Deruell, a sophomore at Charter University Prep, won first place at the National level, while Hannah Frost, eighth grade, secured third place. At the Regional level, Senior Juliana Eggert, won first place, and eighth grade student, Abriana Stewart, placed second. Elyse Johnson, a Junior, won third place at the Local level. WilleJune Eggert and Cherri Whiteley, key teachers who guided the students’ efforts, are two of the many EDCOE Charter educators who are passionate about implementing rigorous and engaging curriculum that boost each student’s potential. Such teaching methods aid in relevant and effective communication skills that not only secured these awards, but will also facilitate a seamless transition to the students’ chosen college or career. For more information regarding the EDCOE Charter programs operated by the El Dorado County Office of Education, visit our website or by calling (530) 295-2259.